Campers in all age groups experience a unique, hands on learning experience in a laid back atmosphere that is meant to inspire! We teach important skills using curriculum tested in sewing studios across the country. Intro to Fashion Sewing - Learn to sew in 3 fashion projects! ITFS is our 8 hour foundation sewing skills module for beginner stitchers in 4th grade and above. All students transitioning into our 200 level courses must complete these three projects. In our summer program we offer this as part of each camp week. Campers are split into 2 groups by age: Kids (6-8) and Juniors (8-10). They work on the same general theme throughout the week but with separate instructors and age/skill appropriate projects. Seamsters Local runs weekly programs all summer for all age groups in our air conditioned Marblehead studio. 200 Level is focused on fashion and garment sewing. Each week has a fashion based theme with special projects, areas of study, challenges, and local field trips or guest speakers pertaining to that theme. 4th graders and up with foundation sewing skills work with FashionKit Patterns to create capsule collections based on the weeks theme. We include special modules on styling, textile design, and fashion illustration. Advanced stitchers who attend any 200 level camp are welcome to choose any project from our FashionKit Patterns library to work on independently. Participants who are new to sewing must take our Intro to Fashion Sewing class, camp, or equivalent to gain foundation skills before moving on to 200 Level FashionKit Patterns projects. We offer this 3-project curriculum as a 10 week course in the spring and along side 200 Level camps in the summer. 4th graders and above who are interested in fashion can “level-up” quickly in our summer program by taking a full day (or 2 half days) of Fashion Camp. 1/2 day campers in ITFS will complete 3 core projects plus participate in other camp activities like textile design, illustration, styling, mood boards, etc. 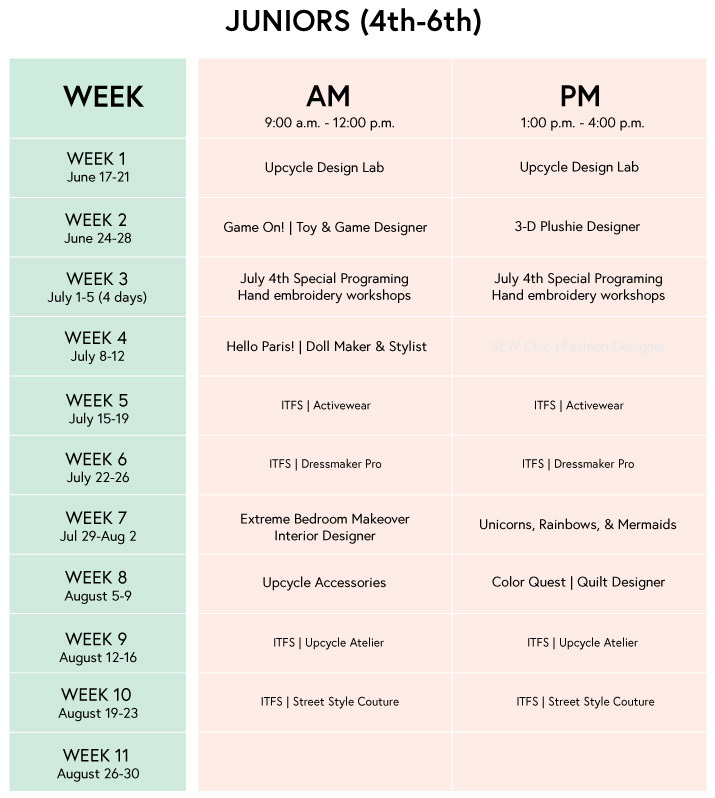 Full Day campers in ITFS will complete 3 core projects + 2 or more FashionKit Patterns projects… and participate in other camp activities like textile design, illustration, styling, mood boards, etc. Each session is 5 days, Monday-Friday. Full Day (M-F 9am - 4pm**) for $525. Register online or in person. We accept all major credit cards, cash or check. Payment in full is required to reserve your spot in camp. MONDAY: Mood Board Monday - We discuss the theme and projects for the week. Students have an opportunity to plan their projects and make visual representations like illustrations or mood boards. After snack we learn how to use the sewing machine or get some practice in if the student is already familiar. We also review machine safety at this time. EVERY student MUST review this every half day session (even if attending full day)…however we do give more seasoned students the opportunity to help teach this lesson. What is a summer session day/week like?